Module SNMP Collector allows receiving of various data from external devices using SNMP protocol. SNMP Traps, set for external devices, allow instant reception of notifications about any problems in CDN by Operator of Control Room. 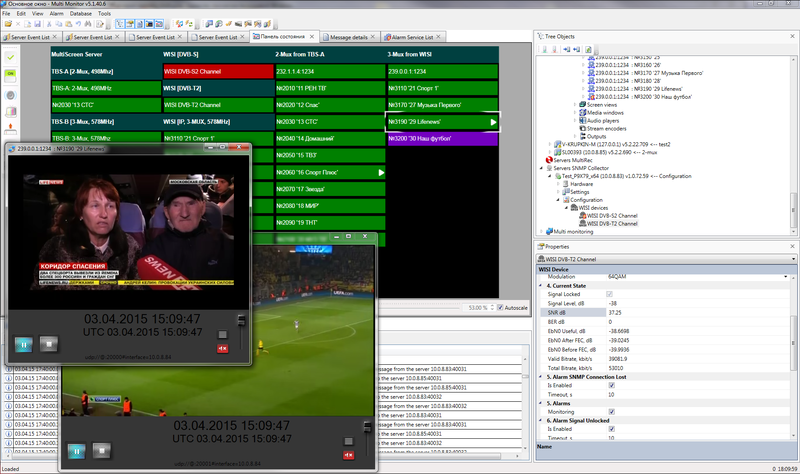 Visual and Audio notifications are being received by Operator in MultiMonitor, which is a main tool for control of the status of TV channels, as shown on the picture. Monitoring of DVB-T2 and DVB-S2 signals, received from Head-end WISI station has been tested and integrated. It allows controlling of interception of the signal by main station, quality of reception of RF signal, capacity of the channel, signal-to-noise ratio (SNR) of input channel, intensity of bit errors BER, Eb/N0 ratio, etc.